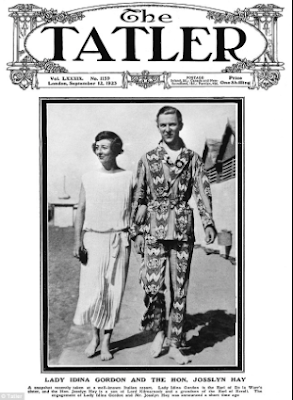 I first heard the nickname "The Bolter" back when I read Love in a Cold Climate by Nancy Mitford, which I loved. In that story, the narrator, cousin to a family of eccentric sisters loosely based on the Mitfords, has been abandoned by her mother, who has "bolted" to live with her lover, or new husband, or something like that. 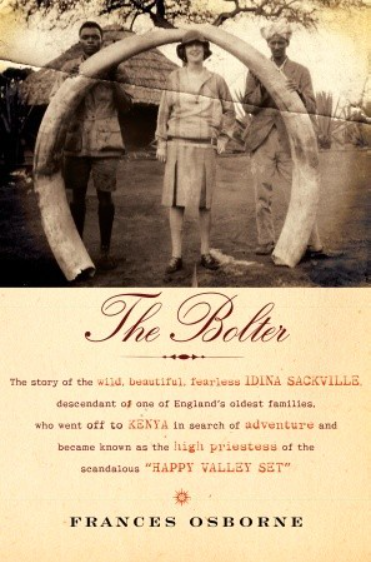 Anyway, Mitford was inspired by an actual bolter -- the infamous Idina Sackville, a socialite who left her husband and two small sons to live in Kenya with the scandalous Happy Valley set: rich white settlers who drank, did drugs, and took multiple lovers between the wars. Idina married and divorced five times and was possibly the most famous of them all. Married at just twenty, Idina left her first husband to marry another man and start over in Kenya because of her husband's infidelities. Apparently it was extremely common for the British aristocrats (both men and women -- as long as the women had produced "an heir and a spare") to take multiple lovers, as long nobody talked about it publicly or had the poor taste to file for divorce, thus making it common knowledge. But when Idina's husband fell in love with her younger sister's best friend, she decided she would rather leave her sons (who could never be raised by another man) and start over in a new country. However, the wild behavior of the upper crust was even worse in the colonies. One of her ex-husbands was almost killed by his new lover in an unsuccessful murder/suicide, and her third ex-husband was eventually shot and killed by the jealous husband of his then lover. Dina with her third husband, Josslyn Hay, Lord Errol. He was later shot and killed by his lover's husband. All this made the news and was naturally terribly scandalous, both in Kenya and back in Britain. After she left her first husband, Idina wasn't allowed to contact her two young sons and didn't see either of them until they were in college. She had a daughter by her third husband, who was sent back to England to live with family there, and eventually became estranged because Idina's behavior and multiple marriages were just too scandalous. She did have stepchildren by her fourth husband that she loved very much, but eventually that husband also left her to marry another woman, taking those children with him to South Africa. Idina's life was really tragic and quite fascinating, in a trainwreck sort of way. I had a hard time with her leaving her small children behind, but then of course I can't imagine what it would be like to have my husband having an affair with my sister's best friend either. (I guess I'm just not cut out for that crazy lifestyle.) She had to have known that eventually her bad behavior would eventually cut her off from her family, but she kept on doing it. 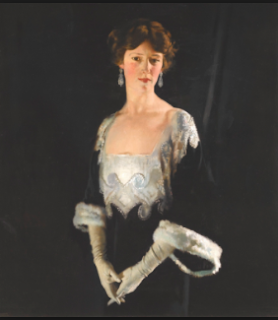 Portrait of Idina by Sir William Orpen. The Bolter was written by Frances Osborne, Idina's great-granddaughter by one of the sons of her first marriage. I can definitely imagine that having such an infamous ancestor would inspire you to write a book. I did enjoy this book though I have a few quibbles -- mainly that the author seemed to take a few liberties with the narrative of the story. Osborne writes about what Idina is thinking and feeling, or describes exactly what she does, without source material. But it's a pretty riveting story, though I did want to jump back in time and yell at her. I was also imagining Lady Mary from Downton Abbey though Idina was way more scandalous -- why hasn't this been turned into a miniseries? This is my first book completed for the TBR Pile Challenge 2019. It`s too bad the author took liberties because this does sound like an interesting read. I champion a woman`s right to leave an unhappy marriage, but four! I`m with you, Karen...a lifestyle like that sounds dizzying and would severely cut into my reading time. I think she actually only left the first one, if I remember right the other four ended up leaving her. I think she just wanted to leave the first one to beat him to the punch. But I forgot to mention in the review that she was also a huge reader -- there wasn't much to do in Kenya, especially in the rainy season, and Idina always read the latest books, and everyone shared -- she essentially had her own book groups! It all sounds too exhausting for me! I remember when Lady Diana was first talked of as a possible wife for Prince Charles the newspapers said - no good as she comes from a long line of Bolters, and she did! Did not know that about Diana. Can't really blame her for bolting, that marriage was such a disaster, so tragic. I'm really glad William and Harry seem to be happily married. I've seen Bolter used elsewhere in novels of the time; I guess it became a popular term. That portrait by Orpen really bothering me though, I can't figure out how that neckline is physically possible! Yes, it looks like she's about to have a wardrobe malfunction! Maybe they had special flattening corsets back then? I think it's from the 1920s. Maybe he took some artistic liberties. I would enjoy this book, her life was certainly a messy one. That is a beautiful painting of her. I read the Mitford novel and the Sisters biography of the Mitfords, fascinating era. I read The Bolter a couple of years ago because I had come across Idina in a book I read about Beryl Markham (another interesting life). I found Idina's life fascinating, but like you, I wanted to yell at her at times. The book was never boring, but I didn't always understand her choices.